I just love this easy finishing technique. This square-knot-based sliding knot looks great on leather bracelets and friendship bracelets and is perfect for hemp jewelry of any kind. Do you make friendship bracelets? Friendship bracelets are often tied on with no way to take them off. 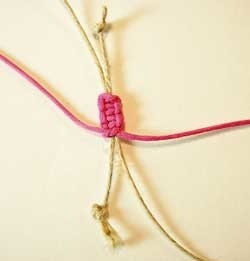 It is a real advantage to use a sliding knot to finish off a friendship bracelet. Tip: This sliding closure is made using a separate cord than your necklace or bracelet so feel free to use a contrasting color (as shown above) or cord that matches for a more low key look. 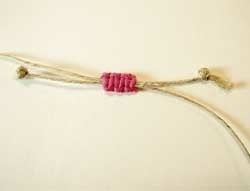 The closure is made up of a row of square knots knotted around the necklace or bracelet strands. 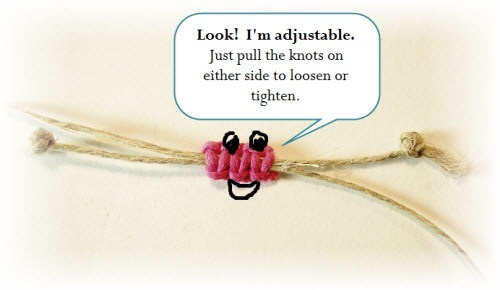 Tie a knot on each end of your necklace or bracelet. These will become the "handles" you pull to tighten the necklace or bracelet. Tip: You might want to add a decorative bead before you tie the knots. Lay one end of the necklace or bracelet pointing down, and the other end pointing up. Cut a second strand of cording. This cording will become your sliding knot. A foot should be long enough. 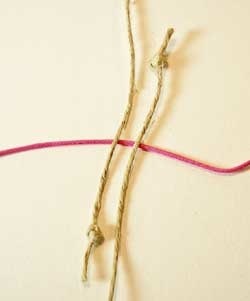 Lay the cording underneath the two ends of the necklace or bracelet as shown. Now tie three square knots. You'll use the two ends of your necklace or bracelet as your "filler" or "anchor" cords. The image below shows the start of your first square knot. Be sure to finish the second part of the square knot (not shown here). 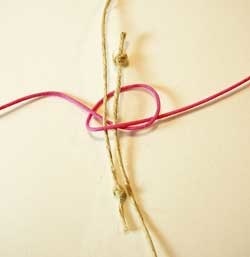 If you need a refresher on how to make a square knot, take a look at the square knot tutorial. 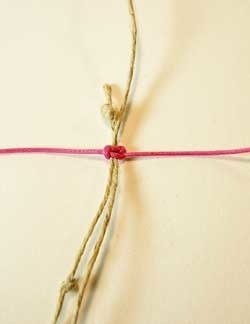 On the underside of your square knot series, tie a tight overhand knot. 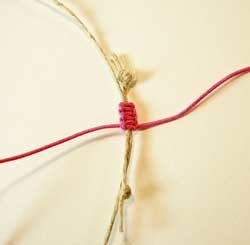 Use some heavy duty glue on the knot and let it dry. 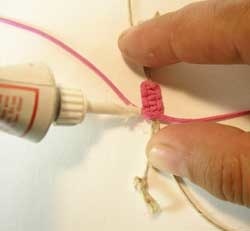 After the glue is dry, trim the ends of the knotting cord. Add some more glue to the newly cut ends to prevent unraveling. Let dry. To tighten, pull on the knots. To loosen, pull on the necklace or bracelet. The sliding closure looks neat and tidy yet decorative, and is really simple to execute. Now that you know how to make it, I bet you'll find yourself using it over and over to finish off hemp, string, leather, paracord, and corded projects. By the way, be sure to share this tutorial. The more it's shared, the more incentive I have to make more for you. Thanks for your support!